The 83-Gallon Deck Box serves your outdoor storage needs. 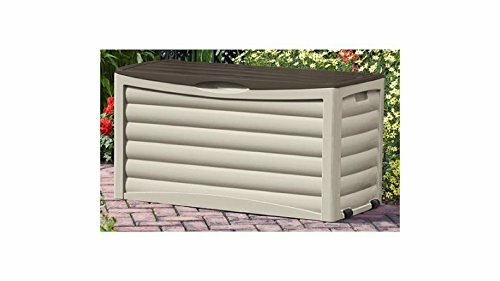 It is great for storing patio accessories, furniture cushions and other outdoor items. It has a storage capacity of 11.1 cubic feet. The outdoor deck box is constructed from a special type of resin that will stay dry and rust-free in all weather conditions. The wheels and handles make this deck box easy to move, so you can always rearrange the box on your deck, even when it's full. This resin deck box is easy to assemble and is made to be weather-resistant, long lasting and durable. It is great for storing yard and garden accessories, while providing a decorative addition to your outdoor areas. It is an attractive combination of design, function and features. This storage container boasts an excellent storage capacity and is ideal for smaller patios. If you have any questions about this product by Suncast*, contact us by completing and submitting the form below. If you are looking for a specif part number, please include it with your message.